AN INVISIBLE ELASTIC BELT FOR LADIES!!! NO SHARP CLASP-Our adjuster is smooth and durable that don't worry about the broken or sharp clasp. No hurt on your finger, your waist skin or your pants loops. NO SHOW BUCKLE, NO BULGE-Invisible flat buckle, no show and no big buckle to affect the beauty of your outfit. Meanwhile, this elastic buckle belt could give you the sense of security which no buckle belt couldn't. 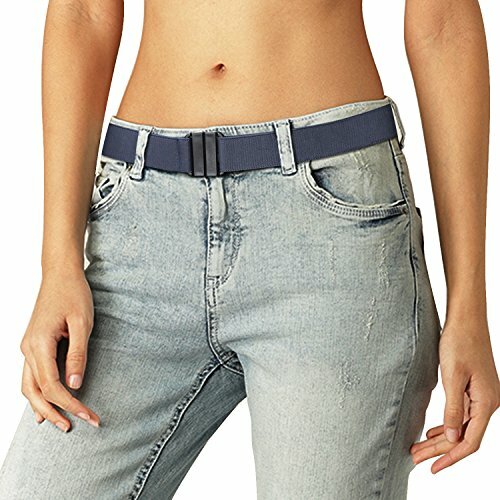 NO BELT LOOPS REQUIRED-This invisible stretch belt is not like the free buckle elastic belt, only great for jeans, pants or skirts which has pants loops or have to add some metal buckles. Our designer women elastic belt is also perfect for dress or long blouse that without pants loops. NO CURB-No Matter Squat Down, Sit Down, Bending Down even Weight Fluctuation,this unisex stress-free stretchy belt perfectly solves the force from leather or nylon belt. It is also convenient for pregnant. NO HASSLE-No need to repeat the belt off and on when passing AIRPORT SECURITY and METAL DETECTOR all the time. NO SUPERFLUOUS WEIGHT-Lightweight and breathable as elastic belt advantage is suitable for outdoor activities and sports. We design this buckle-free elastic belt to provide a more convenient and suitable invisible belt to MEN, WOMEN, the YOUNG and the OLD. If there are any questions, please contact us via xzqtive1@outlook.com. FUNCTION OVER FASHION INVISIBLE BELT: The elasticated stretch belt is No Show, No Bulge, No Hassle. Also, it can avoid your pants from slipping when you squat down. The slim belt not only great for JEANS, SHORTS, but also for DRESS, LONG BLOUSE as accessories belt that let you feel free. This designer belt keeps your pants in place all day! Belt is 1.5" wide so it fits through most of the belt loops. ADJUSTABLE JEANS WAIST BELT! This designer invisible elasticated belt is to give more convenience and suitable belt in your pants. Full adjusted: 1) 20"-38"(US 0-14), 2) 34"-52"(US 12+). *Smooth and Friendly Adjuster on elastic belt gives you the safe feeling well using this invisible belt. PLASTIC BUCKLE ELASTIC BELT: No metal parts quick buckle belt. AIRPORT SECURITY and METAL ALLERGY FRIENDLY. This plastic buckle belt is also great for those who have metal allergies. If you have any questions about this product by XZQTIVE, contact us by completing and submitting the form below. If you are looking for a specif part number, please include it with your message.